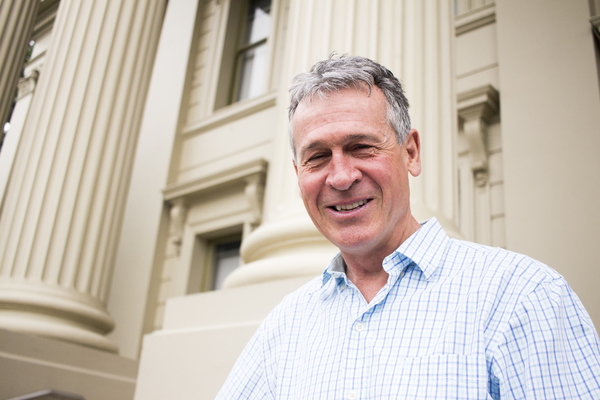 CREATIVE: Geelong Mayor Bruce Harwood is leading the push for zero waste to landfill. Geelong’s council will pick through bins from 225 randomly selected households after announcing plans to eliminate waste going to landfills. The findings would help improve waste services and assist the development of “education programs”, City Hall said this week. The City planned to run the bin “audits” over the next two months to achieve “a better understanding of how residents use their household rubbish, recycling and green waste bins”. Waste trucks would collect audit bins as usual before together the contents from numerous households to create “samples” of rubbish, recycling and green waste. “These bin audits are for research purposes and will not lead to any penalties or investigations,” the City said. “No identifiable details or personal information will be reported as part of the audits so that residents’ privacy is protected. Residents who refused to participate or who wanted more information could contact council, City Hall said. “The bin audits will help us capture an everyday picture of how residents use their household rubbish, recycling and green waste bins,” said council’s environment and sustainability portfolio-holder, Cr Sarah Mansfield. The audit announcement follows council last week revealing that the strategy would seek to eliminate landfill “altogether”. Council would “take the lead” under the strategy while supporting the households “to achieve the same”. “Zero waste to landfill is an ambitious aim but one greater Geelong is committed to achieving by showing leadership in this area and providing support for the community in reducing its own waste,” Mayor Bruce Harwood said. City Hall said the strategy was “in line” with council commitments after becoming in 2015 one of three Australian councils with One Planet Living certification from Bioregional Australia. Bioregional Australia describes itself as a not-for-profit, independent organisation advocating for “a better, more sustainable way to live”. “We work with partners to create better places for people to live, work and do business,” the organisation’s website says. Bioregional Australia says One Planet Living is its “vision of the world where everyone, everywhere can live happy, healthy lives within the limits of our planet, leaving space for wildlife and wilderness”. The organisation operates under licence from the UK’s Bioregional Development Group, a charity with other “sister organisations” in South Africa, Mexico and Greece.